...how's that for a blast from the past - 1984 style! It was milking time on our farm (5-6:30 p.m. or so) and my mom came running in the house, telling us to get into the basement. She ran around opening windows and we got some bottles ready for my brother. At some point, I must have gone outside to have a look for myself and if anything could scare the crap out of an eight-year-old, that was it. I just remember thinking, "OMG, that's huge!!" Little did we know that it was still near the Missouri (about 6 miles south of our farm) at the time that we were seeing it. I also remember hearing the warning siren coming from our small hometown of Tabor, SD about a one mile away. My Dad was outside watching the storm come closer and I remember being quite nervous about this. I kept asking my Mom why Dad wasn't coming down. This tornado missed our farm entirely, but it did hit a few spots in our hometown...not huge devastation, but it certainly did some damage. Luckily, that's the closest our family has ever come to a tornado. This weekend has certainly brought back those memories, however. 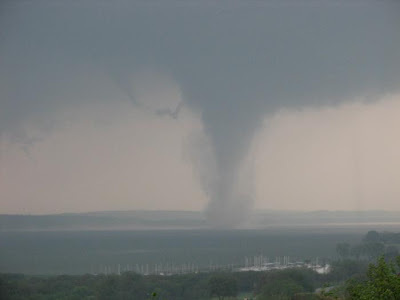 Yesterday, we were reminded once again that we live in tornado alley as there were tornadoes (yes, plural) within 5 miles or so of our home in Yankton, SD. Here's a picture (borrowed from KSFY.com) of one that touched down just a few miles west of town ...I know because I recognise the view. See the splashes of white and the pole looking things along the bottom of the photo? Those are the sailboats in the marina! The city sirens went off several times during the late afternoon to early evening. Kaitlin and I were watching the weather at home and she was a little worked up about the whole situation. There were times that Justin and I were talking and she would say, "You guys, be quiet! I'm trying to listen to the weather!" Eventually, Kaitlin and I went down to the basement...where we spent most of the evening and eventually ended up sleeping for the night. She kept asking "What are we going to do when we have to go to the bathroom!?" (we don't have one in the basement), "What are we going to do when we need food!?" At the point that we went down to the basement, just guess where Justin went. Of course, he had to go get CLOSER to the storm...it must be a guy thing. My only regret is that I didn't send the camera with him! He did come home safe and sound (probably in no small part to the policemen that were blocking drivers from going out of town) and did get to see several of the twisters on the ground and/or trying to pull out of the clouds west of town. There was some spotty damage in the area...west of Yankton, Utica, etc. There was heavier and more widespread damage in the Mitchell/Hanson, SD areas (northwest of where we live) and many other areas as well. Of course, everyone in the country has probably heard of the devastation to the south of us in Greensburg, Kansas by now. Not only this, but there has been severe flooding in many areas as well. To this point, Aberdeen, SD, which is several hours to the north of us, has had over 7 inches of rain within the last couple of days and as of this morning they have basically outlawed anyone from even trying to travel...anyone caught out could be ticketed! And although it is pretty quiet outside right now, from the looks of the weather forecast, we could have more of the same on the way to our area today. Severe thunderstorms are actually forecasted for the next two days. So, if you don't live in the path of these storms, please say a prayer for us. If you do, let's say a prayer for each other!